When someone yells, Shark! while swimming, normally people get out of the water. So I had to laugh at the irony when, while snorkeling, I saw a Galapagos shark under our yacht, pulled my head out of the water and yelled, Shark! so that my other shipmates could swim over and see it. Almost everyday we snorkeled during our cruise and we swam with many sharks while in Galapagos. They are magnificent creatures. The video snippet below was taken near an island called Chinese Hat. 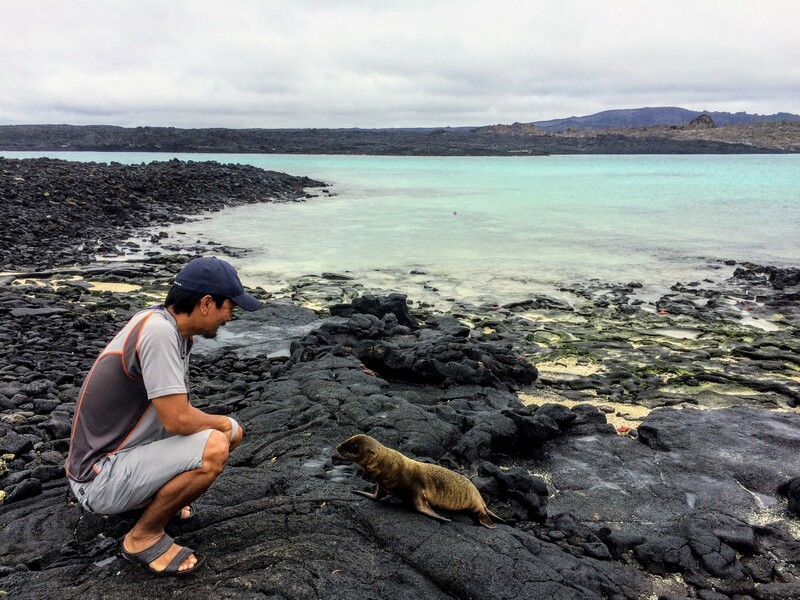 We were very happy with our decision to book an eight-day cruise for the Northern route of Galapagos. It was a luxury to have all our meals and snacks prepared for us, even though Floreana is considered budget class. Each night we would sit on the top deck of the boat where Edgar, our guide, would tell us all about the places we would visit the next day. When we were told one evening that we would navigate overnight to Chinese Hat, Terry stood up and rushed forward to see the whiteboard closer. Terry is one of the three Chinese men who were on our cruise. None of them spoke any Spanish and only Terry spoke a little bit of English. But they were a great part of our group. Terry was so animated he could get most things communicated just through expression. Tonight was no different and we all laughed at his antics. Terry and his friends made us all laugh daily. I loved the huge smiles that all three of them wore with their excitement of the islands. They were always ready with a laugh and with awesome huge cameras capturing amazing pictures. Even with few words their positive attitude shone bright. 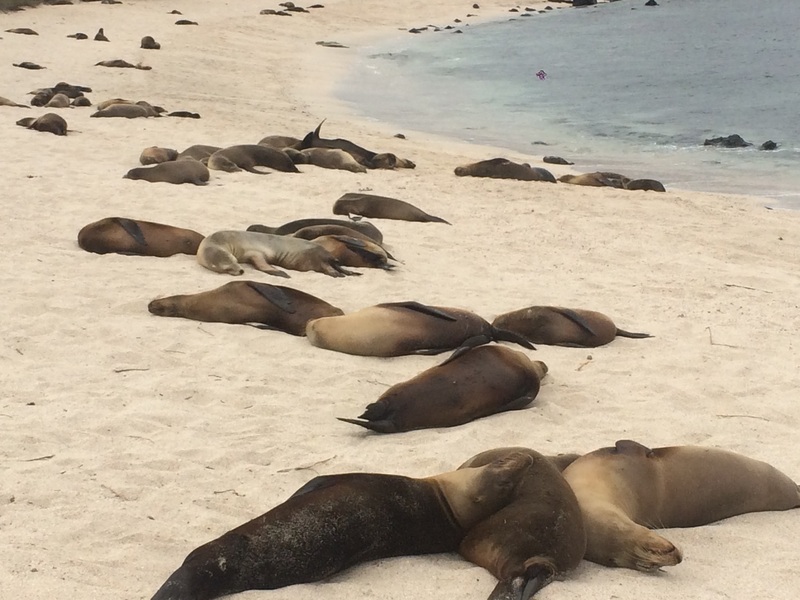 On one island we found two female sea lions who had just given birth. They lay in sandy patches nursing their newborn pups. The placenta can be seen nearby indicating that they were born just that morning before we arrived. As we walked further down the beach I spotted a third female. She seemed to be moaning in pain and moving a bit funny. She looked like she was about to give birth and I watched her with swelling excitement, waiting to witness the miraculous moment. She began to push, and grunt. And then it came out! A little too easily I thought. It was too small for a baby sea lion. It did not move and it did not have any appendages. The sea lion ambled off toward the water to go for a swim, and left me staring at a large turd. Time to catch up with the group. At dinner one evening I asked Frank, the German, if he knew any jokes. Frank is a very tall, muscular German with a chiseled face. He would be scary to meet in a dark alley, but when he smiles his features soften up. He had the perfect demeanor for my favorite kind of German jokes. The next day we docked near Fernandina island and took some pictures on the beautiful beach. When we showed this picture to Terry, he happily yelled out “Kangaroo!” pointing towards Frank. Then he tapped his chest and said, “Me, baby Kangaroo.” Frank’s laughter rang out. After we had fun with pictures we turned down the trail to see more wildlife and the remains of a settlement that was attempted on an island with no fresh water. Frank had five jokes he thought about overnight to tell. Something about the serious way he and other Germans I’ve met (Jonas in Leon) tell their jokes makes me laugh every time. Each island we walked was a little different: Genovesa island, topped with dry dormant Palo Santo trees and filled with various bird species; Rabida Island with its red sand; Bartolome Island with its cooled lava flow. It seemed every island had red crabs that could be seen from afar with their stark difference to the black lava rocks on which they clung. The red crabs are called Sally Lightfoot. Green sand beach on Santiago Island. And a crab. Sea lions pretty much own these islands and can be found laying all over the place. As we were leaving Tagus Cove we sat along a ledge to wait for the dinghy. A sea lion approached us and sat there looking at us like, “Hey you are in my spot.” We stood up and moved down the beach. As soon as we were out of his way he made himself comfortable on the ledge we had just vacated. Our time was filled with laughter and hours of watching the unique animals on the island and in the water. 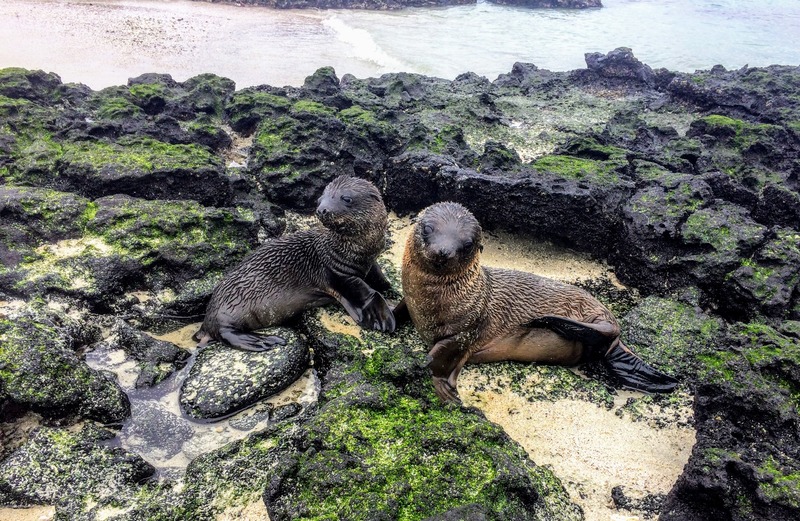 Indeed it was difficult to walk away from these baby sea lions just playing the morning away in these tide pools. 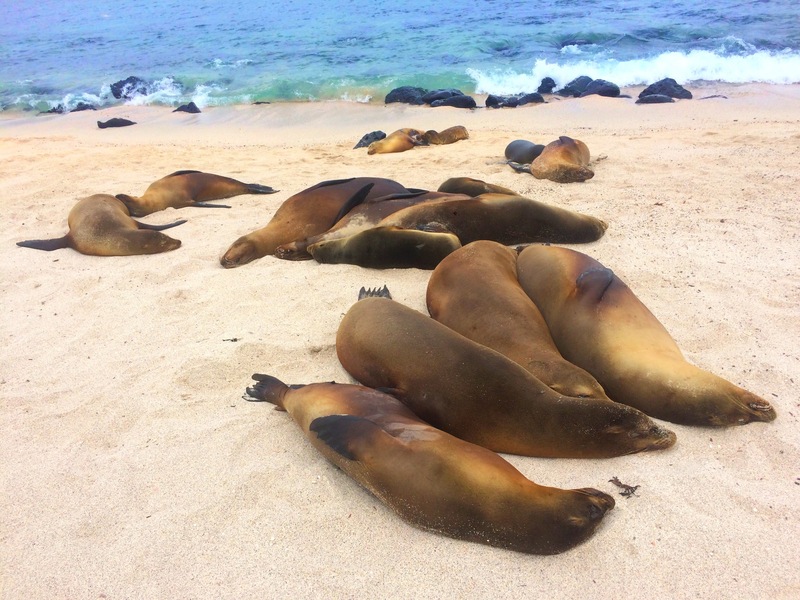 While we were snorkeling around Rabida Island, these sea lions decided to join our swim. 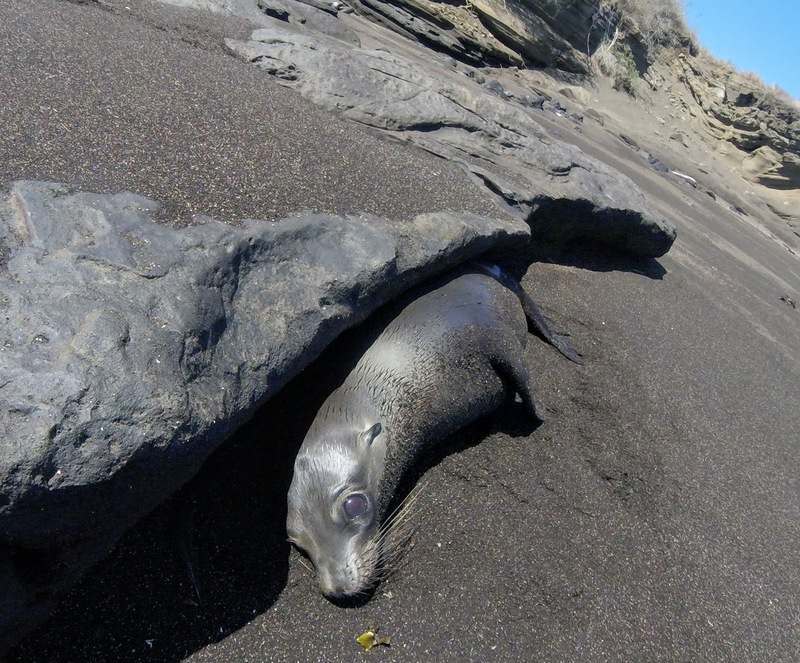 This one, taken at another beach, shows just how curious and playful even the adult sea lions are. 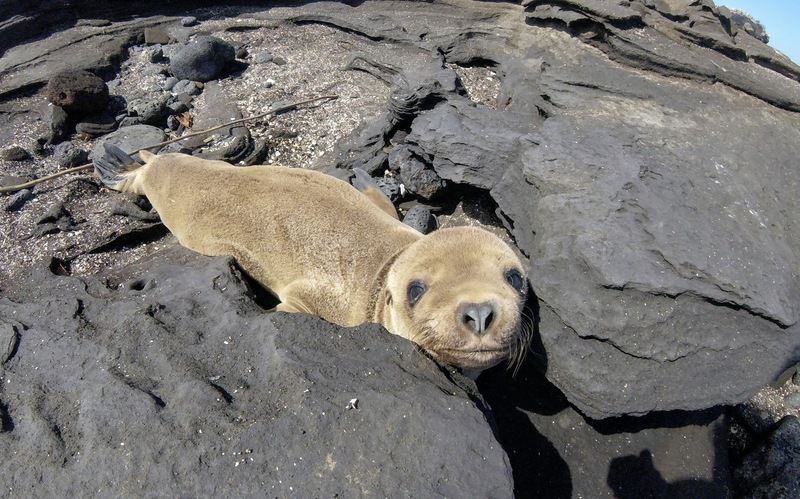 And just because they are so adorable I’ll end with pictures of more sea lion pups. Chinese men at Chinese Hat haha! Seeing these sea lions remind me of my snorkelling experience with them! Those three were awesome. We communicated with pictures and gestures and had a great time. Thanks for adding your link. I love your blog! You made a good career move when you chose not to go to veterinarian school. Great blog.